If you are wondering how I did personally the last time around, I lost 23 lbs total, as I extended my own game into 8 weeks. Since then, I have gained back 7lbs. Many of the good habits stuck, but not all, so I am using this round to get back into the swing of things. If you are at all tempted to do this yourself, get the book and join in on the fun. A fun, competitive way to take off a few pounds. When I first agreed to join a Game On Diet team, I wasn’t sure what to expect. 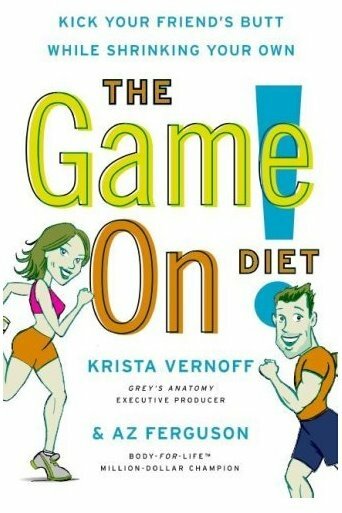 Dawn made it sound like so much fun and I had read Book Club Girl’s posts about Game On and I was intrigued with her success on the program. However, when the book came, I was a bit overwhelmed. You see, there are points to be made and penalties to be had. A good choice could get you points for your team but a BAD choice could cost your team points and who wants to be the one bad egg in a group of Grade AA’s? Not me!! You need to eat 5 mini meals a day. You must get at least 20 minutes of exercise in every day unless it’s your day off. You must give up a bad habit and replace it with a healthy habit. There’s more, but you get the idea. Basically all that was lovely and good in the way of food goes bye-bye and gets replaced with Greek yogurt (and lots of it! ), low-fat string cheese, low-fat cottage cheese, veggies, nuts and palm sized portions of protein. Now there are other foods out there that fit the program but because most of the foods I picked had to be easy and quick to grab, I ended up with a lot of dairy in my diet. When I incorporate what I’ve learned into my everyday diet, I plan to balance it out a bit more. I really can live on 5 small meals and not be hungry. Food played a big a role in my life. I ate out a lot and it was actually a form of entertainment. How sad! I now know to balance it out a bit more. I plan to enjoy the people I am with and not focus on the food so much. I’ve learned that I like exercise. Having a routine has really helped me feel a lot better. That my previous diet was filled with processed foods. Eating whole foods has actually killed all my cravings for the bad stuff. Now a bit about the book itself. I feel that the book is broken down into logical, very readable sections. However, it is missing an index which I could have really used since I had to refer to the book often while playing the game. I appreciate the humor to a degree, but during week 3, which I felt was the toughest week, I found the humor to be a bit irritating. It could be that the lack of fried foods in my diet sucked my sense of humor dry. That’s always a possibility. Overall, I found the team concept to be very effective and in the end, I lost a total of 10 lbs. I had a slight gain one week (damn that week 3) which slowed me down but I am happy with losing what I did and I feel as if I can follow this program on a regular basis. Four weeks was just enough time for things to become habit for me. Denise of M. Denise C.
Kathy also has other team mates, but they aren’t bloggers, so I have no links. Oh, except for a last minute addition…Vasilly! ( I stole all of this from Jill/Fizzy). Thanks to Book Club Girl for providing us with copies of the book and for being our Game On mentor. Thanks to Dawn too for getting the teams together and for handling all the logistics. As of this writing, I do not know which team came out ahead but in the big scheme of things, I’m not sure it really matters. Ten lbs down and three inches lost overall is pretty darn good. I am continuing with the plan, just not the “team” part of it. I want to see how well I can do on my own. If you have been curious about the plan, check it out online, then get the book, form a team and dive in!